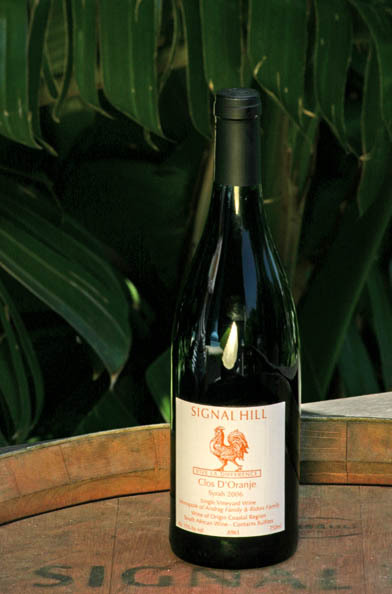 SIGNAL HILL wines are sometimes made in very small and rare batches, and they are not all available worldwide. To give you an idea, Clos d'Oranje is only 600 bottles per vintage, so you will find it in top restaurants in France, in Greece, in South Africa, in Mauritius and in Dubai... but once the allocation for the trade is finished, it is finished. The only Cape Town city vineyard is the South African counter part of the Parisian Clos Montmartre that Jean Vincent RIDON vinified for the vintage 2001. This small block, located at the bottom of Table Mountain, on Lincoln road, is the only visible sign of the wine history of Cape Town which started in 1659 when the first wine was produced from grapes grown in the Gardens. 600 bottles were produced from this unique "plot" of UNGRAFTED syrah. The vines, grown according to organic farming practices, are hand harvested at perfect ripeness to protect their unique flavours. This legendary wine is the fruit of a partnership between the Andrag family and the Ridon family. The limited production makes it the most sought after South African red wine. Limited quantities, so no more than 3 bottles will be allocated to each wine lover. - SEMILLON 2011 WESTERN CAPE - Original South African grape, even if it can be found in Bordeaux as part of the blend with the Sauvignon Blanc. This very old vineyard, probably more than 50 years old, produce a very very small crop. Fermented in new oak barrels, it was kept on the lees for more than 3 years to allow a perfect creaminess on the palate. It allowed the new oak to be perfectly integrated as well. This semillon is a Classic with huge palate weight but a great balance. Perfect for white meats and spicy food. - CINSAULT 2012 Old Vines from DARLING. Only two barrels made from these very old vines of what was the key red grapes of South Africa. Red fruit, strawberry, raspberry, a fresh acidity and only 12% alcohol! Light oaking, sweetness of the gentle extraction, probably a keeper, but it will be drunk before that. - GRENACHE NOIR 2014 DURBANVILLE - om the deep soil of this cool climate, Grenache can prove why its nickname is "The Pinot of the South"... soft, velvety, powerful, with cherry and blackcurrant fruit, a perfect food matcher, with no visible harsh tannins... Open tank fermented, classic low oxygen fermentation, with feet crushing and stomping, but no pump over... this is a delicate berry... not cabernet sauvignon... so we must respect the fruit to extract the finesse only... Completely unknown to the South African market, Grenache Noir is perfectly adapted to local conditions... when you know how to handle the fruit. Jean Vincent RIDON's experience in Chateauneuf du Pape and in the Roussillon was definitely an asset to produce this surprisingly elegant wine... And we still have some 2002 available on some markets, it is drinking beautifully, so this wine will age nicely. - GRENACHE BLANC 2005 and 2007 PIEKENIERSKLOOF - Our signature white... Vive La Difference at its best... This barrel fermented wine is by far the best grenache blanc produced in South Africa, because it is the only one! 4 stars and a half stars in Platters, selected by Tom Stevenson among the top unusual discoveries of the world, on the shelf of Waitrose in the UK, this wine is unique. Bold, fresh, nutty, complex, perfect with fish and poultry but as well pastas and spicy Asian food. Able to match top Chateauneuf du Pape blanc, wines from Cassis or some whites Priorat or Roussillon, this is an invitation to explore... The 2003 is reaching full maturity and the 2004 is drinking beautifully, developing butter, cream, hazelnuts and marzipan flavours... Grenache Blanc can keep and will satisfy the wine lover looking for complexity... this is not a tutti fruity simple wine, you can decant it to drink it at its best... because it is the best, remember? - L'EMPEREUR ROUGE - SWEET NATURAL WINE - UNCERTIFIED - ACTUALLY CABERNET SAUVIGNON FROM PAARL - Once again the South African Wine and Spirit Board displayed its almighty capacities (the same capacity that make them believe that South Africa is a natural producer of grassy sauvignon blanc) in rejecting a wine that has received awards everywhere else ( 4 stars and a half in Platters, twice!). They must be forgiven, as most of the panel members are beer and brandy drinkers; and not necessarily Belgian beers... Overripe sun-drenched cabernet sauvignon from Paarl, as a late harvest... fermented on the skins for 10 days, then pressed and finished in barrels. 85 grams of residual sugar, and the freshness of the Cabernet Sauvignon... a very interesting wine that will offer you a unique experience, even if some journalists compare it with old style Vintage Ports... a good compliment if you think of a 63' Noval or a 77' taylor's... Mostly dedicated to cheese and chocolate desserts, it can be a nice support for a Bobotie or a Peking style duck. To keep... as long as you want. Bottles of 375ml, so you can open 3 of them when 2 normal bottles is too much. - STRAW WINE 2001 - Unidentified grapes from a very old mixed block on Simonsberg, dating back to the time when grapes where coplanted to reduce the spread of pests and diseases. These hand harvested grapes have been dried in a cool shade on a bed of organic straw, as per the traditional recipes used in the Jura, or in the Hermitage on the Rhone... Extremely sweet, with 278 g/l of residual sugar, the complex spiciness makes this wine unique. Dark colour, fruit of a long fermentation of 24 months in oak, from natural yeast, it reveals honey, cinnamon, vanilla, cloves, nutmegs, but as well papaya, pomagranate, and quince multi layered fruit... 91 in Wine Spectator, and Grand Gold at Michelangelo, a magic wine that will complement even the most demanding dessert... iron fist in a velvet, sorry, silk glove. This unique wine has been a unique once off production of a legendary sweet wine. The SIGNAL HILL ESZENCIA is the highest ever rated South African wine on the US market, with 96/100, by Steven Tanzer. The Eszencia made the top 5 of the most interesting wines of the world by Tom Stevenson, and 5 stars in the Platter's. Only 300 bottles of 375ml have been produced of this nectar. Produced following the traditionnal Hungarian methods, this decadent wine will be able to stand the test of time, and with 520 g/l of residual sugar, and 14,5 g/l of acidity, one can save this wine for the next generation... A blend of Furmint and Sauvignon Blanc, the ESZENCIA fermented in 20 litres glass fermenters for 4 years. Filtered only once at the bottling, this wine must be drunk as the Emperors used to drink the Eszencia, on its own, as a jewel to share. Alcohol content is 5,2%. Available by the bottle. No more than 3 bottles per wine lover.